Q: How do you feel about routines? A: I love routines, actually. I feel like if I don’t have a routine that I’m going to drowned in everything. I have to create some sort of system. However, I can never do this. [Laughing]. I can’t seem to get to the point where I have a routine, even though I know I work best with one. There are so many moving parts to my life, and if there’s no structure to it then I will work around the clock and never take any time off. I have a pretty creative and explosive personality, so I know that I have to be reined in to actually accomplish what I want to accomplish. Routine, scheduling, setting goals, and creating deadlines is really important to that process. With Art Klub the financial situation draws the line for me. At a certain point I ran out of money, so I knew I couldn’t move forward unless I raised some more money. I never think that art is done, you just have to find a place to stop. You’ll often pick up the piece again to redefine it further, but setting deadlines and goals is key. Rather than spinning, spinning, spinning and running, running, running – which is going to happen – having a goal that gets accomplished gives us a little bit of breathing space and allows us to get ready for the next project. Q: Whenever you were assigned a group project, who would you become in that project? A: Leader. Although, I think it’s because I’m usually the one that starts the group project. A lot of the time my group projects were theater based. I was usually a leader because I didn’t really get cast as a leading lady. I was always the character actor, and I could never find my niche in acting and theater, so I created my own opportunities. I would work with small organizations that would develop new kinds of theater and performance. Then I would really get in there. I would start these projects and then work with others to collaborate, so in that way I’m not necessarily the leader. I would say I spearhead the project because at the end of the day someone has to be steering the ship, but really it is a fully collaborative experience. When it comes to everyone I work with, we all know that we’re in it together. Q: What is something in your room that you have framed, and what is the story behind it? A: I have wacky stuff framed in my house, so it’s really hard to choose. If I had to choose one, there was this artist named Margie Schnibbe who I knew in Manhattan in 1989 and the early 90s. That was the time when I was in school in New York. I went to the National Shakespeare Conservatory. As part of our summer program we would go to upstate New York in this little town called Kerhonkson near the Catskills. If you can imagine, there were around twenty eighteen-years olds out in the middle of the woods learning theater and dance. It was this place of free expression where you could develop performance skills, so it could get intense. Well, there was a woman there named Margie Schnibbe, and she was the cook. She would go back and forth between New York and this summer camp. She was this wild artist that was a total trip. Before it was hip and posh, she had a place on the lower east side on Edgewood Avenue. She was a total pioneer and down-to-earth artist. Anyway, I have this series of work that I got from her. It’s a series of collage pieces. They have cut outs from children’s books, like horses, sheep, dolls, ducks, and lots of these images from the 50s. Those are pasted onto what looks like an old telephone book page, and it’s trimmed with black tassels. One of the collages says, “Home is Where the Heart Is.” I have that one placed in-between the kitchen and the dining room. The second one in the series has the same trimming and there are pictures again of images from a children’s book, and this one says, “Lovin Don’t Last But Cookin Do.” That one is over my piano. Then the third one has the same tassels and different children book images, and it says, “Touch it and You’ll Go Blind.” That last one is in my bathroom. [Laughing]. That was probably much more information than you needed. [Laughing]. Q: Would you ever want to remove a memory? A: I wouldn’t. Obviously, I know that people have memories that are not happy or pleasant. Part of the experience of living life fully warrants itself to arriving in places that are not pleasant, and that is all part of life. All the experiences we have in life help us become who we are. I don’t want to sound cliche, but we do grow from our experiences. With that said, there is a part of time that I wish I could revisit and handle differently. Having done what I did, even though in retrospect I don’t think it was a good idea, I wouldn’t want to remove that memory. It affects so many things and people involved. To remove that would also mean to possibly invalidate the pain and suffering that other people had during that situation. In a way, it validates where we are today. 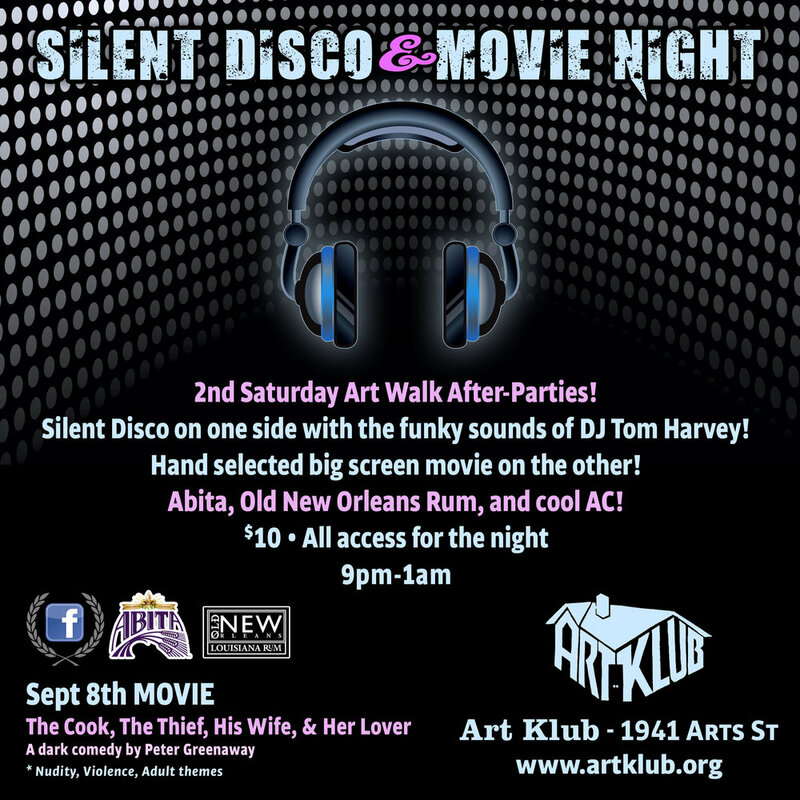 Art Klub, which has recently reopened, will be hosting a silent disco and film screening for the 2nd Saturday Art Walk After-Hours party. There is a suggested donation of $10 for the event, and this event is BYOB. For more information about the silent disco and Art Klub, check them out here.